Biography of Mohandas Gandhi, who developed and introduced the doctrine of nonviolent resistance to the colonized people of India and who ultimately gained the nation its independence. Directed by Richard Attenborough and starring Ben Kingsley as Gandhi. Eight Oscars. 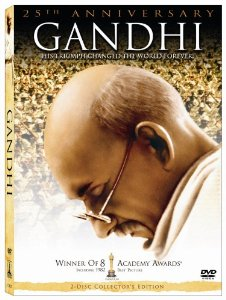 True story based on the life of Mohandas Gandhi. The form of nonviolence practiced by Gandhi is called Satyagraha, a combination of satya (truth-love) and agraha (firmness/force). It is the vindication of truth not by infliction of suffering on the opponent but on one’s self. Satyagraha is peaceful. Opponents must be converted by a demonstration of purity, humility, and honesty. They are to be converted — not annihilated. Violence, Gandhi said, creates bitterness in the victim, and brutality in the attacker. Satyagraha assumes there is a constant dialogue between the opponents with a view to ultimate reconciliation. Insults, threats, and propaganda only serve to obstruct the goal. Although rated PG, some of the episodes where the Indians clash with the British may be disturbing. Gandhi is a masterpiece, a loving tribute to a saintly man. It has been criticized for this very reason – making a saint of Gandhi. Critics also have complained that it elevates his role in Indian independence at the expense of others, particularly Jinnah, the founder of Pakistan. (Begin with the British uttering the word Salt) The British learn that Gandhi plans to march to the sea and make salt, in defiance of British law, which controls and taxes salt production. They decide to ignore him. In talking to a journalist, Gandhi explains that the purpose of civil disobedience is to provoke a reaction and they will provoke until the British react. Hundreds of thousands of Indians begin making and selling their own salt in open defiance. Under direction from home, the British arrest thousands of Indians. Gandhi declares his intention to lead a peaceful takeover of a salt works and is arrested on the eve of the action. The British brutally club the Indians as they nonviolently and relentlessly attempt to enter the salt works. A journalist reports that the naked brutality displayed by the British guaranteed Indian victory. 1. Would nonviolence as practiced by Gandhi have any affect upon a dictator like Hitler, Saddam Hussein or Slobadan Milosivic? Why or why not? 2. Satyagraha maintains that opponents must be converted by demonstrations of purity, honesty and humility. Can you think of ways that this could be used in your own life to diffuse potentially violent situations? 3. Gandhi called his autobiography The Story of My Experiments with Truth. What do you think he meant by this? 4. What role did the media play in Gandhi’s version of nonviolence? Would his actions had the same effect 50 years before, when there were no newsreels or radio broadcasts? 5. During the salt march the Indians broke the British law against making salt. What is the difference between civil disobedience and ordinary law breaking?